Diagnostic Approach to Feather Picking / Feather Chewing. Ninety percent of all plucking is linked to nervous behavior. However, there are valid medical reasons that cause feather plucking / mutilation. Please check this website for information on causes and treatments - medical and behavioral. The first and most important thing is to have the bird thoroughly examined by an avian veterinarian. I always recommend to clients to give their bird the benefit of the doubt and first assume it is a medical problem. If medical problems are ruled out then we can safely spend the time needed to work on the behavior. Cure Boredom: Dr. Jill M. Patt, DVM highly recommended the foraging dvd to the right that provides simple and inexpensive-to-free ways of occupying your parrot. Many behavioral problems are caused by boredom, under-stimulation and frustration about being kept in a cage without any interaction for 8 to 10 hours a day! Parrots are intelligent creatures and the frustration they feel can only be compared to a four-year old child being kept in a playpen all day without anything to do. Leaving on the television (animal or discovery channels are great), calling your own home phone from work and talking to your parrot (over the answering machine) is a great way to break up your parrot's routine. Additionally, adding foraging opportunities will make a HUGE difference to your parrot's emotional well-being. 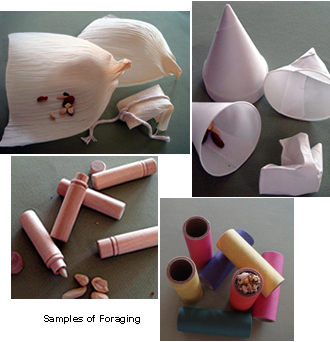 The Foraging DVD featured to the right will give you plenty of inexpensive or even ideas as to how to achieve a more stimulating and fun environment for your pet. A product called "Stress Control" by King Bio Inc. has also shown effectiveness against stress-related plucking. It is a natural herbal mixture that relieves stress and anxiety in most pets, including birds. This product also helps with aggressive behaviors. One Customer review states that this "PRODUCT TRULY IS A MIRACLE WORKER!". It is added to a bird's drinking water. The package also indicates "Advanced Homeopathic Formulation with NO Side Effects 100% Safe Natural." Stress Control: List of Ingredients and Application. Stress Control has very similar ingredients as another product marketed specifically for use on birds, known as "Pluck No More", but the latter is far more expensive. These products may work great for parrots suffering from stress or anxiety, but the cause of the stress or plucking may still need to be addressed, especially since there may be physical causes. Therefore, please also go over the following website to assess the cause of the plucking, which could be as simple as changing the location of the cage or may require veterinary intervention.. The following information has been provided by Dr. Jill M. Patt, DVM practicing in Mesa, Arizona. Dr. Patt has been keeping and raising exotic birds for years, providing her a unique knowledge and understanding that goes beyond that of a regular vet who does not have the benefit of daily interaction with birds / parrots. Feather picking is the most frustrating behavior we have to treat in the veterinary medical field and skin mutilation is the worst manifestation of the behavior. The first and most important thing is to have the bird thoroughly examined by an avian veterinarian. I always recommend to clients to give their bird the benefit of the doubt and first assume it is a medical problem. If medical problems are ruled out then we can safely spend the time needed to work on the behavior. Over preening is often the first sign of a potential feather picker and can be seen in birds of all ages but I often see this in young birds that have not yet started to pick. Certainly, not all over preeners will go on to pick, but in my experience these birds are at a higher risk of becoming pickers. So what is over preening? My definition is a bird that almost appears obsessed with its feathers and appears to constantly be preening or mouthing its feathers. Of course, preening is a normal activity that is needed for the health of the bird, but the individuals I'm discussing seem to be "mouthing" their feathers the vast majority of the day and with increased frequency when disturbed by environmental change. Also, the feathers of these birds often look "ragged" due to this over preening. In my experience these birds are less confident and more prone to emotional upset by any type of change. However, these guys are the lucky ones because if caught at this stage they have a good chance of a normal life in captivity. Our feather chewers can be self chewers or can be companion birds that are picking or chewing the feathers of the face and cheeks of their cage mate. For this discussion I'm focusing on the self chewers as another manifestation of picking. Okay, these guys are not necessarily pulling out entire feathers but actually appears to be grooming and while doing so are chewing off parts or all of the feathers. Some of these guys will only have the tips of the feathers chewed as seem by the jagged/irregular edges. The others of this group will actually chew off the entire feather and can chew all feathers on the body or just a select few. The chewed feathers can be identified by the remains of an irregular feather shaft especially on the wings and tail. The feather plucker is the most common type we see in practice. These guys will vary from the bird that just plucks a few coverts exposing the fluffy underlying gray down feathers (often over the top of the wings) to the bird that has plucked its entire body. 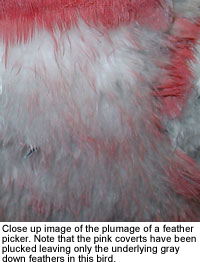 Please note that pluckers cannot pluck out head feathers so if a bird is also missing head feather (and doesn't have a cage mate that may be plucking) the bird is likely losing feathers from another cause such as PBFD virus. So, the typical whole body plucker has few to no feathers on the entire body, except the head which is usually in perfect feather. Often we see these birds after they have been plucking for an extended period of time or have seen several other veterinarians. Again, realize that it is best to start treatment early with all feather pickers and to do a complete laboratory health work-up first. 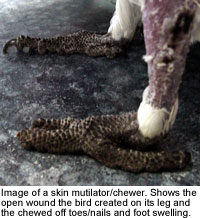 Not all feathers chewers or pluckers will go on to actual skin mutilation, but this manifestation if the most dangerous for the individual bird. These birds will also pluck feathers, but will go on to actual chewing/tearing of the skin. Areas targeted can vary but often I see injury/scabs on the keel or feet and legs. The injuries can vary from mild superficial skin wounds to life threatening injuries. I consider this an emergency problem for the bird and thus it must be addressed immediately. I'm not a big fan of placing birds in e-collars (cones that look like lamp shades and placed around the neck to prevent access to the body) but often time these guys have to be collared to prevent ongoing injury. If an e-collar is used it is extremely important to work on correcting any underlying medical and/or behavioral issues. The e-collar should not be used as the correction to the problem and the bird should not be made to live its life in the collar.